If you are having overnight guests and don’t have an extra bed then air mattresses are a great way to provide a comfortable place to sleep, while not taking up valuable space when not needed. They also work great for camping instead of laying on the hard ground with just a sleeping bag. However, you should be aware that most the models on this list have a built-in pump with a plug-in for a standard outlet, and therefore are recommended for in-home use and not for camping. You can see our pick for the best camping air mattress here. When shopping for the best air mattress you should look for one that is obviously comfortable, durable, one that inflates and deflates fast and easily, and one that is the size you need. For in-home use, models with a built-in pump range in price from about $40 to over $200. Below we reveal the top 10 best air mattresses and review each one. 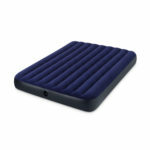 At the bottom you will also find a comparison chart so you can compare each airbed easily. Our choice for the best air mattress is the $120 SoundAsleep Dream Series Air Mattress. This is the best-selling air mattress on Amazon and has won several other Editor awards from various websites. Featuring a built-in pump that inflates and deflates quickly, this thing is perfect for in-home use to get a good night’s sleep with a firm, yet comfortable feeling. Its fully inflated dimensions are 78 x 58 x 19 inches. The pump is powered from plugging it into a standard outlet, so it is not really meant for camping. However, for indoor use we recommend the SoundAsleep Dream Series over all others since it is the best queen sized air mattress. If you only need a twin size model then you should know that the SoundAsleep Dream Series also comes in a twin size for around $95 and is our pick for the best twin size air mattress. It is virtually identical to the queen size model, but the fully inflated dimensions are 73 x 38 x 18 inches. These things are perfect for in-home use when you have just one overnight guest. The electric 1-click internal pump can inflate this bed in under 3 minutes. Overall the SoundAsleep Dream Series Twin Size is a great solution for anyone who needs an air mattress for just one person to sleep on. 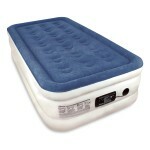 Next on our list is the $124.50 Serta Raised Bed with Never Flat Pump. What makes this thing stand out is that it has two pumps – one that inflates and deflates the airbed in less than 4 minutes and a secondary pump that monitors and silently maintains the air pressure so you get your desired comfort level while sleeping without losing air. It comes in queen, queen with pillow top, and twin sizes. The queen measures 80 x 60 x 18 inches when fully inflated. 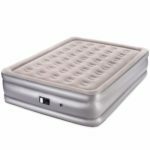 If you get frustrated with mattresses that lose air while you sleep then the Serta Raised Bed with Never Flat Pump is perfect for you. The best queen size air mattress under $100 is the Coleman SupportRest Elite PillowStop Double-High Airbed which sells for $99.95. This Coleman bed has a few features we really like. First, it is designed with a raised head to keep your pillows in place. It also has a double lock valve to keep it leak free. The built-in 120V pump inflates the bed in under 3 minutes to the final dimensions of 78 x 60 x 18 inches. 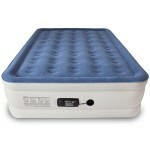 This Coleman airbed has a soft plush top and is pretty comfortable to sleep on. 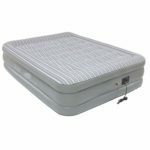 Overall the Coleman SupportRest Elite PillowStop Double-High Airbed is a solid choice for anyone wanting a queen size airbed. We think the best non-raised airbed is the AeroBed Classic Inflatable Mattress with Pump which sells for around $70. Measuring 78 x 60 x 9 inches when inflated, that low 9-inch height is a negative for some people. 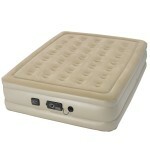 An electric pump is included with the AeroBed Classic, but not built into the mattress. It is made from a heavy-gauge, puncture resistant PVC vinyl. Since it is not a raised bed and thus taking up less space, the AeroBed Classic Inflatable Mattress could make a good choice for camping, in addition to home use, if you have access to standard outlet to plug in the pump. 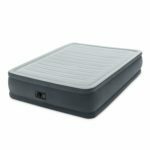 If you want a never flat, raised bed like the Serta, but want to spend less money then take a look at the Insta-Bed Raised Air Mattress with Never Flat Pump which sells for about $97. We think it is just a bit less comfy and heavier than the Serta, but still quite good. It has all the same features like the dual pumps and different sizes available in queen, queen with pillow-top, and twin. The queen measures 80 x 60 x 18 inches when fully inflated. If you want an air mattress cot then the $129 Coleman Airbed Cot is for you. The queen airbed sits atop a steel frame cot that can support users up to 600 pounds and up to 6 feet 2 inches in height. The design provides storage space underneath and comes with side table with cup holders. A 4D battery-operated pump is included to fill up the bed to dimensions of 78 x 59 and it sits 22 inches off the ground with the cot and mattress. The airbed and cot fold up to fit inside the included carry bag, however it weighs about 42 pounds so it is not the easiest to move around. One big complaint is that the cot is quite noisy, making squeaks when you move or adjust your position. 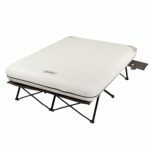 Other than that, the Coleman Airbed Cot is a really solid unit that works well for indoors or outdoor camping where you want to be elevated off the ground. At $70 the Mpow Queen Air Mattress is a very affordable double-high air mattress and presents one of the best values. It has a good shape and firmness for weights up to 600 pounds. A built-in electric pump inflates or deflates the mattress in about 3 to 4 minutes with the inflated dimensions of 80 x 60 x 19 inches. Four extra repair patches are included in the storage bag and each product comes with an 18 month warranty and 45 day money back. We feel the Mpow Queen Air Mattress is a good choice if you want to save a bit of money over the models that cost around $100 or more. We believe the best air mattress under $50 is the Intex Comfort Plush Elevated Dura-Beam Airbed. It is covered in plush flocking that is soft to the touch, and the horizontal air chambers provide added stability and support around the entire bed. The electric built-in pump can inflate the mattress to 80 x 60 x 18 inches in 3.5 minutes. It has a max user weight capacity of 600 pounds. The biggest downside to this Intex Airbed is that there is no warranty and they have been known to leak air easily. If you need a cheap air mattress then you can’t go wrong with the Queen-sized Intex Classic Downy Airbed which sells for just $15. This thing is far from the best and will probably lose some air overnight while you sleep, but at this price it is hard to complain. It measures 80 x 60 x 8.75 inches.